Days and days of sunshine – what more could you ask for? Here, in Carmichael, California, you can have the opportunity to be in the heart of Sacramento County and enjoy all that makes this city suburb unique. Appealing to the soul of different individuals, Carmichael enriches the lives of its residents by exhibiting the arts, sourcing local, staying “green” and keeping active. This vibrant city maintains a small-town feel by encouraging the community to take part in a variety of activities that are in place to promote the well-being of a close-knit community. In Carmichael, you can experience an interactive dining experience as you walk through a 40,000 square foot public marketplace of interconnected upscale dining establishments at the Milagro Centre. Or you could graze the local Farmer’s Market, which takes place year round on Sundays from 9:00am to 1:00pm for a fresh meal. Either way, there are plenty of things to do to support local growth of your community. Prefer to spend those sunny days outside and stretching your legs? In the heart of the city, you will find Ancil Hoffman Park where 396 acres backing up to the American River are open for play and recreation, consisting of bike and running trails, picnic areas, and a full golf course ranked among the best in the country. Maybe something a little less strenuous? Try visiting the Effie Yeaw Nature Center, a 100 acre nature preserve and educational center with plenty of local wildlife to see! Living in or near a city will always allow plenty of vibrant experiences but getting out into nature is always fun, too! By residing in Carmichael, CA, you can have the best of both worlds where you have close access to the city of Sacramento and state universities, but have Yosemite National Park, beaches and other national forests easily accessible right outside your door. These destinations are a reasonable commute away if you would like to plan a weekend trip with friends or family! Whatever you choose to do with your free time, you will rest assured that you will always have the option of experiencing something new in Carmichael, California! 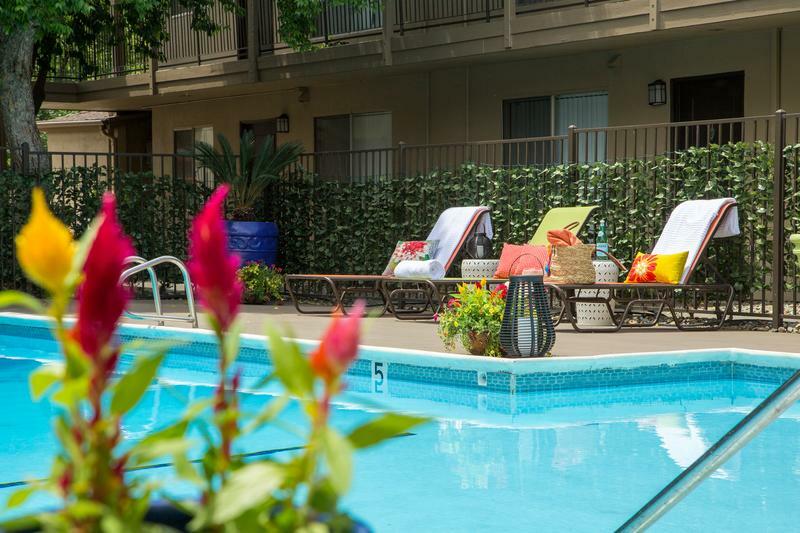 Abby Creek Apartment Homes are located in the heart of Sacramento County in Carmichael, CA. Just minutes away from downtown, the city is conveniently located near shopping, dining, entertainment and so much more. Our apartment homes feature one and two bedroom floor plans and townhomes, all of which include luxurious amenities. Each apartment includes a large gourmet kitchen with granite-style countertops, white cabinetry and optional stainless steel appliances. Enjoy the privacy of your own home with a set of full-size washer and dryers and a patio or balcony to sit back and relax after a long day. Enjoy a modern home with crown molding, USB outlets and large walk-in closets with built-in shelving. If you’re looking for pet-friendly apartments for rent in Carmichael, CA, look no further. All family members are welcome at Abby Creek – including large breeds! Furthermore, you will have full access to our 24-hour fitness center! We’ve got free weights, cardio equipment and strength training equipment, so you’ll never have to go far to fit in a workout. Make you you take a dip in our resort style-pool, because one day in the sun and you’ll feel like you’ve stepped into a luxury vacation. Find out all Abby Creek has to offer and schedule a tour today..